This week has been a bit too full for writing, but I thought it would be fun to share this again – quite possibly the most frequently visited post I have ever written. 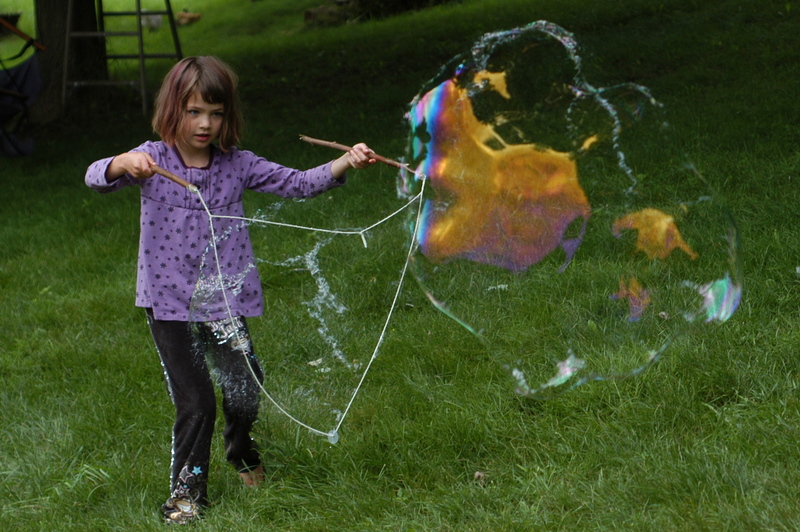 Dig in and make some huge bubbles this weekend! In short, I got a much needed attitude adjustment. Because with six to eight foot bubbles floating across my yard – well, I couldn't stay crabby even if I wanted to. And it didn't cost us a penny. Our supplies list was scavenged up between our basement and our workshop, our kitchen and our brush pile. Cut two branches, trimming off any side branches or pokie bits. Shoot for around 12" to 24". Cut a length of kitchen twine or yarn (mine was cotton) approximately 6' long and thread through your sticks and your washer. Tie with an overhand knot anywhere you like. You can also use my more basic recipe if you don't have some of her ingredients, like corn starch or glycerin. Thanks for the tutorial, its a great way to re-energize.